Sensing Systems Embedded in Machines: Towards a Better Management of Operations in Viticulture. 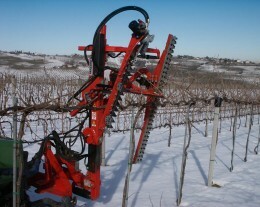 Practical Applications of Precision Viticulture in Australia. The New Architecture in the Vineyard System Management for Variable Rate Technologies and Traceability. La "VIARTE" Project: the Knowledge of Whole Surface Variability within a Precision Viticulture Approach. Development and Application of an Autonomous and Flexible Unmanned Aerial Vehicle for Precision Viticulture. Comparative Assessment of Different Sensing Technologies for Mapping the Vineyard. Applications of Computer Vision Techniques to Assess Canopy Features, Cluster Morphology and Berry Size. Portable NIR-AOTF spectrophotometer: a Useful Tool for the Quality Grape Control in Vineyard.